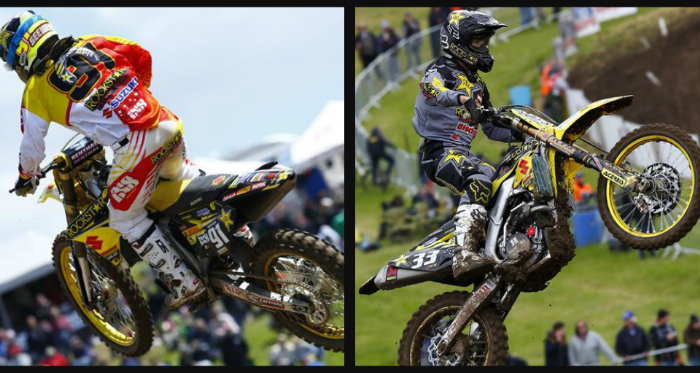 Team Suzuki Press Office – May 25. Jeremy Seewer picked up another decent points haul for Rockstar Energy Suzuki Europe at Matterley Basin, surrounded by 25,000 spectators, for the British Grand Prix and the eighth stop on the FIM Motocross World Championship today. The Belgian steered his RM-Z250 to 13th and ninth in the two MX2 motos under bright skies on England’s south coast across one of the best-received racing surfaces of the season. Copious rainfall in the days leading-up to the action at Matterley and again Saturday morning and evening meant a soft and grippy course that allowed riders to express themselves and seek out new and alternate lines to gain an advantage on their rivals. The quick and fluid layout also created a long lap. In this natural ‘arena’ Seewer didn't get his weekend off to the best of starts as a crash on Saturday led to a stiff shoulder and left wrist. It also hurt his start position chances as he lined-up in the gate down in 25th position. The Swiss performed admirably to grab 13th in the first moto and then clashed with Valentin Guillod during the second on his way to a pleasing ninth. It was his seventh top-10 finish in his rookie term. Julien Lieber was less than satisfied with 15th overall: The Belgian was hampered by his starts and a crash in the first moto put him down to 16th. He was held up by a fallen rider in the second sprint but was more in-tune with the track and improved to 12th. With eight of 17 rounds chalked-off the calendar Seewer is 11th in the MX2 points table with Lieber 14th and the absent Glenn Coldenhoff is ninth. The crew will motor through France this week and to St Jean d’Angely for their next Grand Prix fixture on June 1st.